Using a driving simulator is ideal for a diverse range of scenarios which would be too complicated, costly, time consuming or dangerous to test in the real world – stay on the safe side with virtual vehicles and virtual pedestrians! This allows you to perform experience-based investigations for concrete test cases from A for autonomous driving to Z for zero emissions. 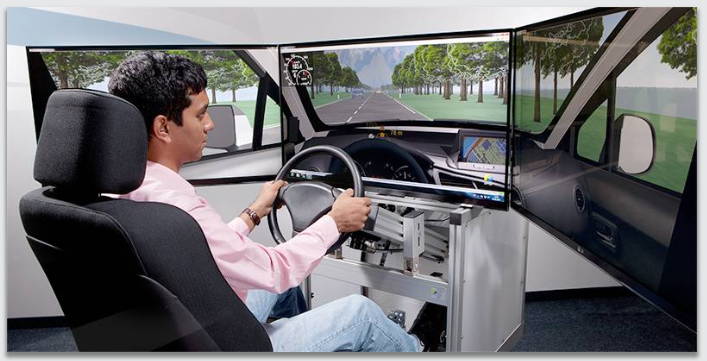 The static System Experience Platform (SEP) driving simulator is the ideal tool for subjectively testing vehicle functions through direct experience – assertions regarding the operability and the behavior of systems can be made at an earlier stage than usual, especially in the area of advanced driver assistance systems.